Still, as a brand they haven’t forgotten their roots and remain a solid destination for those who bet on the horses, as well as controlling pool betting country wide. The Tote stuck to Horse Racing pools for most of its life, but has now branched out to offer fixed odds on everything from Gaelic Football to who will win Strictly. The Totepool is still their biggest calling card, however, offering a variety of ways to bet on UK and Irish races, while outside of the pool fixed odds are available on races the world over. We feel Totesport are in a bit of an in-between place at the moment. They are not the company they once were, nor are they yet the company they are going to become; but for now, they offer those who wager on the Sport of Kings one the best betting experiences available. For everyone else, though, we’re not so sure. We all know that the folk at Totesport are first and foremost Horse Racing specialists, but they do offer a decent selection of around 30 other sports categories as well. Football, Basketball, Badminton, and Esports are some of their strongest areas, with prices available on Football events from Europe and further afield even in the lower leagues and reserves games. There is plenty of stateside action too, especially within Ice Hockey and Basketball, the former boasting a good selection of markets as well. Sadly, though, the markets within each event generally don’t get anywhere close to many other sportsbooks, and some categories even come up void of any events whatsoever. Totesport do ok with bigger events, sometimes reaching around 100 markets for top flight fixtures, which is a good number even if it is easily beaten by the bigger brands; but things really start to drop off when it comes to smaller games or less popular sports, to the point where there are only a few markets per event, if that. However, the odds on show are competitive, especially on ante post markets and Football markets. They do Best Odds Guaranteed on the horses, plus Daily Specials and Long Term Specials. There are even promotions specific to the Totepool. In a nutshell then, if you are betting on anything other than the horses you can probably find more elsewhere. This is an area where Totesport have notably improved in recent years. For most Football games you can expect between 20-50 markets depending on the league and where in the world they are playing, but higher tier UK fixtures start around 70+. For everything else you are looking at 30 markets or less apart from the odd American Football game. Around 150 events across ten categories are available midweek which gives you a sense of the coverage, but again, market depth takes a nose dive when you get off the beaten track. They have done what they can to make up for the lack of live streaming by offering a live radio commentary service that runs alongside the in-play area, which is a nice nostalgic touch, perhaps, but it’s not really the same. 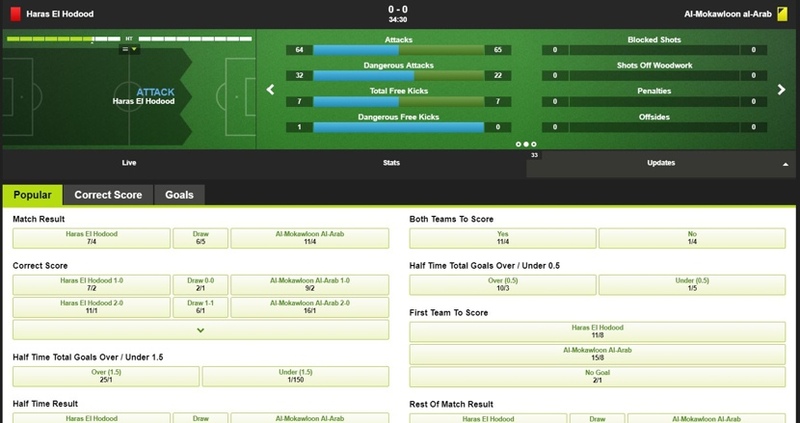 There is a game graphic for some events but it’s by no means guaranteed, and even if there is one the level of detail varies from one event to another; in-game stats and live scrolling updates are employed for Football matches but most other sports display nothing bar the current score. 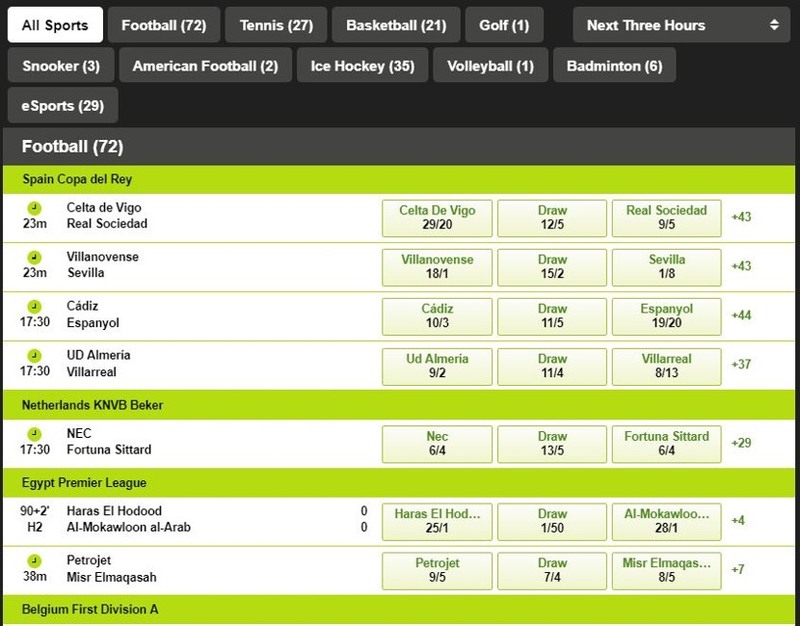 The interface doesn’t differ much from the home page and is easy enough to use if a little uninspiring, but we will say this, it’s very quick to jump from one sport/event to another, and you can keep half an eye on the odds of a Basketball game without leaving the Football match you are currently focusing on by using the dropdown menu’s. There are a good number of options at your disposal when depositing and withdrawing to/from Totesport, but they can be a bit difficult with their rules and regs. Many options don’t have fees attached, but Bank Transfer deposits will cost you £7.50 unless you deposit more than £170, and if you try to withdraw more than once in 28 days it will cost you £12. Withdrawing funds to Neteller that were not deposited in the same way will cost you 2%. The obvious feature is the Totepool which has plenty of features all of its own, so we will try and cover them individually within this section. There are one or two other features on the site like virtual racing, live radio commentary, and a betting guide, but they are fairly self-explanatory. If you are the sort of bettor that just likes to put the occasional fixed odds bet on your local team to win at the weekend or maybe have a punt on who will be crowned King/Queen of Wimbledon, you may not have come across pooled betting. In its most basic form it is actually very simple. Think of it like the lottery; all of the stakes wagered go into one big pot, then that pot is divided up amongst the winners. It can make for smaller payouts if lots of people make correct selections, but it can also pay out big time if you are the only one. Add into the mix the many different bet types and variations on each and you have yourself a pretty thrilling setup, creating some heart pounding moments waiting for that final selection to come in. Scoop6 – Pool is split into a win fund, a place fun, and a bonus fund. Punter picks 6 horses to win in six different selected races. Those who pick all six correctly share the win fund and play for the bonus fund. Those whose horses didn’t all win but did all place share the place fund, but no bonus fund entry. The bonus fund goes to whoever picks the winner of one further nominated race the following week. Jackpot – Correctly predict the winners of the first 6 races at a nominated event. If they all come in you win. Any other result means you lose your stake. 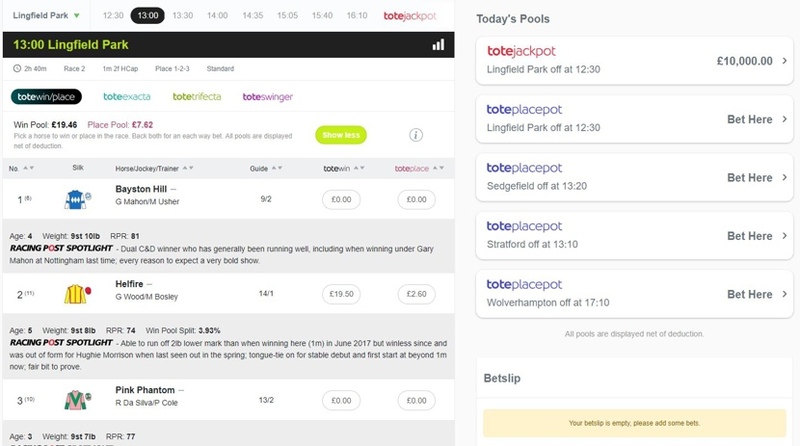 Placepot – The most popular bet at any UK/Irish meeting. Pick a horse to place in races 1-6 and if they all manage it you win, if they don’t you lose. In this way, you can win even if none of your horses do, and you can wager on more than one horse in each race if you want to. Quadpot – You might want to do this if your Placepot has already lost in leg 1 or 2. You just need to pick a placed horse in races 3-6 and if they all come in you are quids in. Exacta – There are 3 options here: Straight – Select a horse to come 1st and another to come 2nd, they must finish in the correct order for you to win. Banker – Pick one horse to finish first and as many as you like to finish 2nd, although the more you pick the more the bet will cost. Combination – Pick 2 horses to finish 1st and 2nd in any order. Trifecta – The same as Exacta (Straight, Banker, Combination) but you are additionally choosing a 3rd place horse. 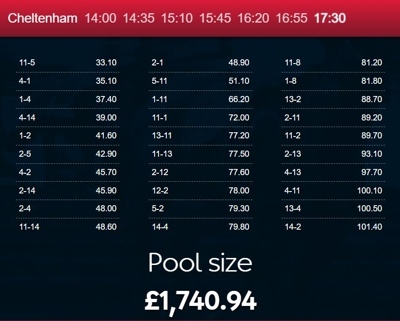 The Live Info area of the Totepool is where you can view all the latest information regarding upcoming races, such as the current pool size for the various bet types for each race, any non-runners, as well as previous results. It’s a useful tool for deciding where you will lay your next bet, and what kind of profits you could be looking at if your selections come in. 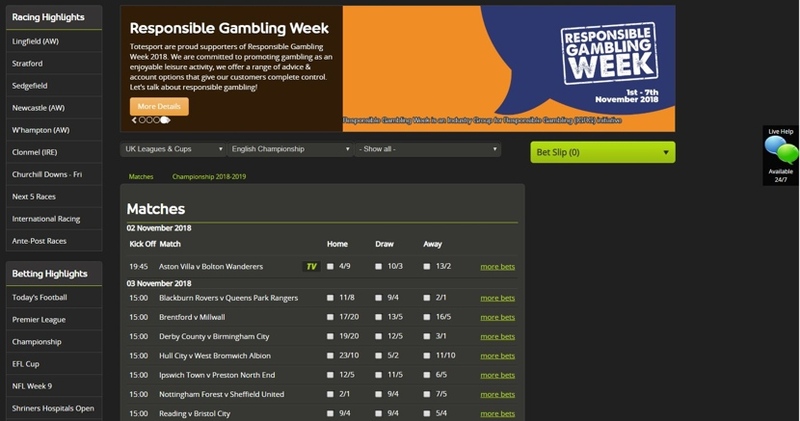 You can’t bet directly from the Live Info area but it does link back to the betting area. 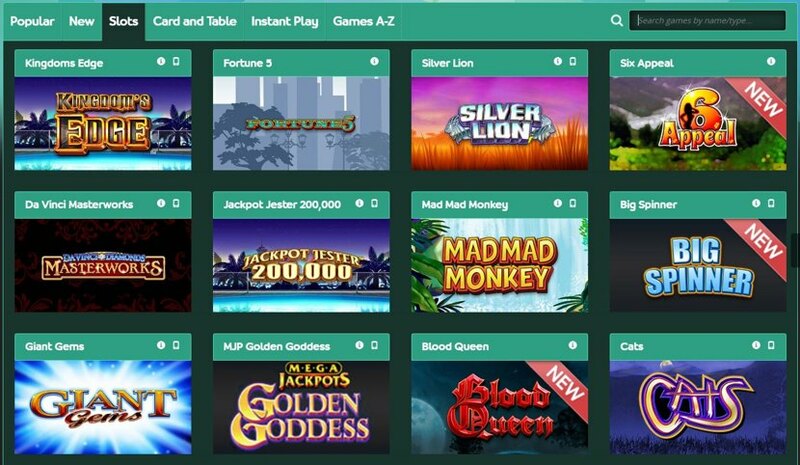 Although it’s not listed as a Casino, Totesport does offer a collection of around 130 slots and 20 Card & Table games in their Games area. There is no Live Casino or anything else for that matter, so it really is slim pickings compared to pretty much everywhere else, but if your main focus is sports betting there will be enough to tide you over in the downtime between races. The website is a fairly simple affair, lacking any real ingenuity or special features. This makes it feel bland if you have played at some of the bigger named bookies, but it does have the benefit of making it ridiculously easy to navigate fairly quick to load. We did have a few issues in Chrome, though. The homepage offers Racing Highlights and Betting Highlights as well as your standard list of Sports Categories, then proceeds to list all of the day’s events and odds down the middle of the page. This leaves a lot of dead space and doesn’t exactly ‘wow’ you when you log in. We have used apps that felt more comprehensive and feature rich. The lack of market depth and statistical information also makes it feel empty, like a computer game with only 2 levels, and the site doesn’t flow particularly well either. We felt we were constantly having to retrace our steps after reaching the end of the line. The site works and there is nothing really wrong with it as such, but they need to do a lot of work to bring it in line with the competition; but to be honest, we don’t get the impression they are really trying to. In complete contrast to the desktop site, the mobile site is fluid, modern, and sparky, with a well assembled interface that allows you to move freely from one part of the site to the other without getting trapped down any dead ends. The in-play capabilities are just as good on mobile as they are on desktop and even feel a bit more fun, especially with the radio commentary going on in the background, and you lose nothing from the range of events and markets. The Totepool functions equally well, and if you do ever get lost/stuck the menu button is on hand to help you back to where you want to be. 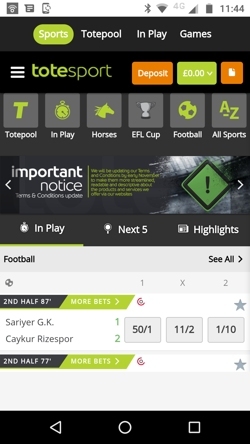 Clearly, having less content to include has allowed Totesport to create a mobile product that is perfectly structured, flows naturally, and gives the punter what they need when they need it. If only the desktop site did the same. If we told you that the Tote was set up by Winston Churchill would you believe us? Well, it’s true. In 1927 Churchill’s answer to combat illegal bookies was to set up a government owned bookie and reinvest some of the profits back into the sport. Initially aimed solely at racecourses, the Tote grew to run its own line of betting shops, a telephone betting service, and they eventually ventured online, too. At around the same time, in 2004, the company rebranded as Totesport. The pool betting service, known as the Totepool, would still be available but punters could also explore fixed odds betting opportunities on Football events, Racing events etc. Come 2011 the government decided it was time to sell Totesport and Betfred beat off stiff competition to take the reins, at a reported price of £245 million. Although this was seen as a controversial sale at the time, with Fred Done’s intentions being questioned, Betfred has kept the Tote brand true to their past, and Horse Racing is still what the company is known for – although these days they offer something of a more rounded service to bettors. They now employ around 4,000 staff and have recently extended their monopoly on pool betting until 2025. However, with 25% of the Tote already sold on to Alizeti consortium, a group of racecourse owners and breeders who are trying to ‘take back the Tote’, who knows what will happen next? If Horse Racing is your thing then this is the place to come, no question, more so if you like pool betting. There are plenty of interesting bet types to try and it feels as though every race in the world is covered. Serious sports bettors should avoid altogether, but if you just place the odd sports bet alongside mainly wagering on the gee gee’s then you will probably find enough variety at Totesport to keep you satisfied. It’s as obvious and as simple as that we’re afraid. Racing aside, most other bookies offer a better service with more features and markets. Totesport provide their customers every option to get in touch for help and advice, and the team work 24 hours a day and 7 days a week. This gives peace of mind when betting online at anti-social hours. The phoneline is free to call, the email address is constantly manned, and the option to contact a Live Chat operator remains onscreen the whole time. The Help Centre will open up a pretty thorough FAQ that lives alongside a betting glossary which we thought was a nice touch. However, when using the Live Chat (which is a complete relic, by the way) we were cut off due to ‘inactivity’ after less than a minute! Rude. So, don’t try and do two things at once while using it or you may suffer the same fate. There is a severe lack of social media presence but that’s not for everyone anyway. 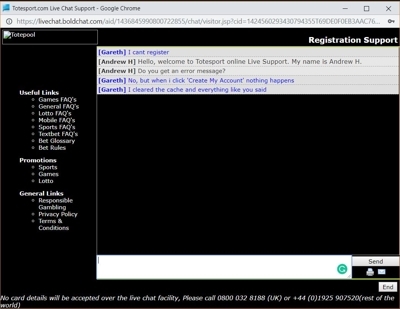 Live Chat – A 24/7 service that is quick to connect, but it’s so dated that it feels like using a 1990’s chatroom. Email – If you aren’t tearing your hair out then try customercare@totesport.com for a timely response.